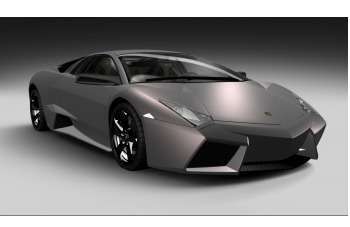 Lamborghini has unveiled the Reventón at the Frankfurt Motor Show. With a price tag of €1 million euros plus taxes, all of the 20 cars to be produced are pre-sold to customers worldwide. Clearly a Lamborghini, but nothing quite like it. A super car without equals: the Lamborghini Reventón is a road vehicle with an extreme specification and, at the same time, a limited edition masterpiece – a coherent style, angular with sharp lines, inspired by the very latest aeronautics. The Lamborghini Reventón has been entirely designed in Sant’Agata Bolognese, the original 'birthplace' of the Lamborghini and the native home of every super car born under the sign of the bull. The design drawn up in Lamborghini’s Centro Stile (Style Centre) is fine tuned in close collaboration with the Lamborghini Research and Development Department. Thus, the Reventón is not only “haute couture” but it also stands out for its elevated dynamism whilst being entirely suitable for every day use. The Lamborghini Reventón is not destined to remain a one-off. A total of 20 Lamborghini friends and collectors are able to own this extraordinary car and, naturally, enjoy the incomparable pleasure of driving it. The present day Lamborghini models are distinguished by the clear language of their shape. The coherent proportions of the Murciélago and Gallardo highlight their power and dynamism. Sharp edges, precise lines and clean surfaces: these are ingredients of a style reduced to the essential. Each element is designed exactly according to its function; ornaments and decorations are foreign to a Lamborghini. With the Reventón the Centro Stile designers have coherently developed this philosophy, inspired by another sphere where speed and dynamism reign absolute: modern aeronautics, responsible for the fastest and most agile airplanes in the world. This has provided an extremely precise, technically striking style with a new vitality: interrupted lines and contorted surfaces provide a fascinating play of light, giving the car incredible movement. The front is characterised by the acute angle of the central ‘arrow’ and by the powerful forward-facing air intakes. Although they do not supply air directly to the turbine like an airplane, bearing in mind the 650 hp, an abundant volume of air is necessary to cool the carbon brake discs and the six cylinder callipers. Naturally, both doors on the Reventón open upwards – since the legendary Countach this has also been a symbol of the V12 Lamborghini product line. With their asymmetric configuration, the large air intakes below the doors provide an example of the extreme coherence with which a Lamborghini fulfils its function: on the driver's side it is large to increase the flow of oil to the radiator. On the passenger’s side of the vehicle, the air intake is flat because in this case, it only has to ensure the flow below the floor. The aerodynamically optimised flat floor structure terminates at the rear with a diffuser featuring an accentuated shape. This guarantees excellent road grip and stability even at 340 kms per hour (on a race track). The engine bonnet made of glass laminate with open ventilation slits offers a glimpse of the beating heart of the twelve cylinders of the super car. The glass also features the marked arrow angle that characterises the design from the front to the rear spoiler. The Lamborghini designers’ enjoyment for detail is beautifully illustrated by the fuel tank lid: a small mechanical work of art, achieved by milling a solid aluminium block. Naturally, such a refined language of shape also demands an extraordinary colour. For the 20 examples of the Reventón, the designers from Sant’Agata Bolognese have produced a totally new hue: Reventón, a mid opaque green/grey without the usual shine. However, thanks to the metallic particles, in the daylight this colour tone features surprising depth. This play of opaque and lustre is also featured on the wheel rims, especially designed for the Reventón. Opaque carbon fins are screwed onto the black aluminium spokes, not only providing a visual effect with the precision of a surgeon’s scalpel, but a turbine effect also ensures optimum cooling for the powerful ceramic brake discs. The same innovative force applied to the exterior design characterises the cockpit of the Reventón. Designed and produced using Alcantara, carbon, aluminium and leather that comply with the top quality standards, the interior is inspired by the next generation cockpits: just like in modern airplanes, the instruments comprise three TFT liquid crystal displays with innovative display modes. At the touch of a button, the driver can choose from two vehicle information display modes. The instruments are housed in a structure milled from a solid aluminium block, protected by a carbon fibre casing. From the conception of the very first radical ideas, the entire Reventón has been developed in Sant’Agata Bolognese thanks to tight teams of remarkable experts. An extremely refined and efficient process was employed: CAD design and development, production of the prototype in the Prototype Department, all carried out under the constant supervision of the Research and Development Department’s technicians and testers. Inaugurated in 2004, the Centro Stile is dedicated to design and characterised by a high degree of efficiency: an “atelier” of designers and prototype constructors, who encapsulate the Lamborghini culture and spirit by using their remarkable skills to design aesthetic innovation. The Lamborghini Reventón is a practical illustration of the streamlined functionality and efficiency characterising the Centro Stile: it took less than a year to progress from the first ideas to the finished car. The complete design process from the first sketches on paper, to three dimensional computer models with 1:10 or 1:4 scale, right up to the real size prototype is organised around streamlined, fast, efficient work groups. Thanks to the Centro Stile, for the first time in its history, Lamborghini is now able to design its own style philosophy in-house without having to rely on any external collaboration. The technology found in the Murciélago LP640 has not been modified. The engine in the LP640 onwards is the classic twelve-cylinder engine with 6.5 litre displacement. Only for this car, Lamborghini guarantees, an astounding 478 kW at 8,000 revolutions per minute (rpm). The huge torque, equal to maximum 660 Nm, ensures a powerful switch from any number of revolutions: even the slightest pressure on the accelerator is spontaneously transformed into thrust. The robotised e.gear changes gear faster than even the most expert driver. In addition, the permanent Viscous Traction four-wheel drive system ensures that every force is constantly translated into movement. As in the original Murciélago LP640, the Reventón accelerates from 0 to 100 km/h in just 3.4 seconds, with a maximum speed over 340 km/h (where legal). Since its foundation, Lamborghini has been a leader of trends in the world of sports cars and has always manufactured cars with an absolutely unmistakable 'character'. Models such as the Miura or Countach, for example, were veritable forerunners and rapidly acquired the status of timeless classic cars. From the moment they are launched, every new Lamborghini promises to become a legend, destined to become a sought-after and precious possession. With the Lamborghini Reventón, Lamborghini has done it again; it has designed an unequalled super car; the perfect synthesis between the exclusivity and appeal of a limited edition design masterpiece, and the dynamism and driveability of a standard sports car. Thus, the Lamborghini legend is further enhanced by another, stylish future classic.